Cellulite is one of the greatest enemies of a woman’s body, given that on the one hand it affects all skin types and on the other hand strikes all ages. Unfortunately, it does not separate and can affect in either a localized and selective way or in a diffused and uncontrollable way the skin and the underlying tissues. When appearing, it always confirms the long-time belief that cellulite constitutes one of woman’s biggest fears. Cellulite is neither an inflammation, nor an illness or even a disease (although it may be painful in some cases) but an “aesthetic plague” that affects 80 to 90% of global women. Many researches have been conducted from time to time, in order to identify the exact causes of the cellulite appearance, but without credible answers. The truth is (and this is recognized by all scientists of the medical world) that cellulite is a “disease” of multifactorial nature. What we should first, is that the term “cellulite” is more of a skin condition rather than a disease. 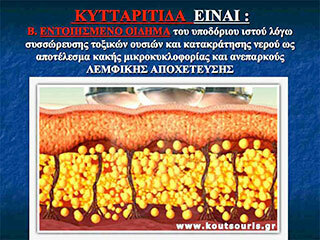 The area, where cellulite is located, does not suffer in the strict sense of the term. 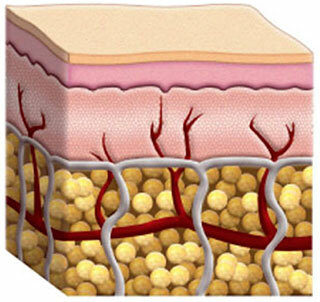 It is a generic disruption of skin-associated adipose tissue architecture rather than a process of localized or diffused inflammation of the skin or fat. The term “cellulite” refers to inhomogeneous water and fat deposition under the skin and the subcutaneous (adipose) tissue, which is accompanied by severe disturbance of blood circulation and tissues oxygenation. This phenomenon of superficially trapped fat leads to increased folding of the skin which takes a different composition, loses its smooth appearance and looks like an “orange peel”. According to surveys, the percentage of women who suffer from cellulite ranges to 85-95%. This is a very high percentage. On the other hand the proportion of men is limited to 15-30%, which is much lower or even nonexistent proportion compared to women. Why does cellulite appear and how deep it “goes” into the skin? The subcutaneous fat is not free under the skin, but is structured and abides by the rules of a strict architecture. Namely, the adipose tissue is organized between the skin and the muscles in small cells, where their walls consist of vertical fibrous connective tissue bands, starting from the muscles and ending perpendicularly onto the skin. It is a unique architectural layout, which looks like several smalls rooms sticked next to each other. Their “floor” are the muscles, skin is their “ceiling” and the bands of fibrous connective tissue are their “walls”, where the fat is compartmentalized and held onto the muscle fascia and ligaments. These compartments contain adipocytes which are effectively enclosed in small “warehouses” with unyieldingly, perpendicular to the skin, walls of fibrous connective tissue in the immediate aftermath of any adipose tissue fluctuation, which causes changes in the size and architecture of these compartments. So what does cellulite mean and why is it a “negative” prerogative of women? 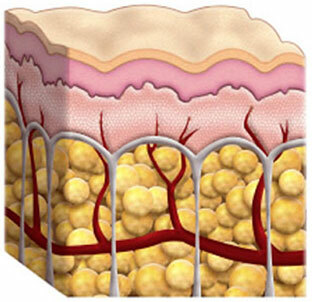 Any lipid storage within the adipocytes of the subcutaneous tissue superficial layer results in the adipocytes’ thickening and “bulging” and as a result, the swelling of the adipose tissue microcells pulls the skin down asymmetrically and gives an “orange peel” image. This phenomenon does not occur on men because the fibrous web in men is not arranged perpendicularly to the skin, but obliquely (criss-cross) so any thickening of the adipocytes leads to a uniform change in the skin surface. Everything is subject to fibrous connective tissue architecture that compartmentalizes the subcutaneous fat. 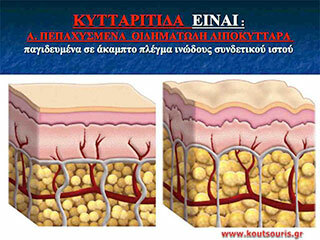 Why and when the fat cells are “inflated” and edematous resulting in unsightly appearance on the skin surface? The explanation for the cellulite phenomenon (i.e. 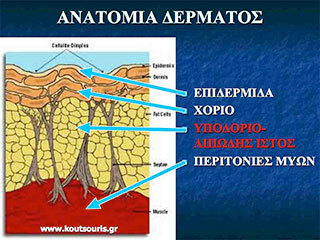 the localized thickening and the local edema of fat cells on the surface just under the skin) is mainly due to the special architecture of the adipose tissue, but mainly in the difficulty microcirculation in the upper layer of the subcutaneous tissue, resulting in growth of toxic substances, which are found locally in the area. Namely, the nutrients from food are transported through the capillaries to the cells and then toxic metabolic products are then removed through the lymphatic system towards the circulation. 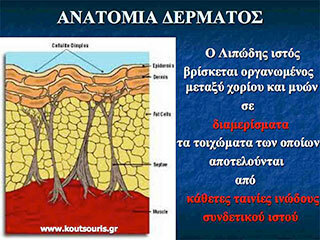 The lymphatic system is responsible for the removal of the cell metabolism products towards the blood circulation, so that any disturbance in the microcirculation could lead to inability of the lymphatic system in removing toxic substances from the surface layer of the subcutaneous tissue, resulting in accumulation of toxic substances, water retention and edema. localized swelling of subcutaneous tissue due to accumulation of toxic substances and water retention as a result of poor circulation and poor lymphatic drainage. 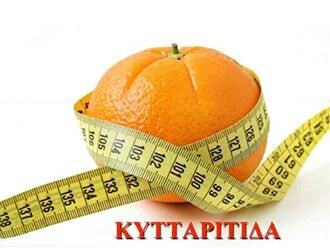 Which are the main causes of cellulite appearance? In which body parts does cellulite usually appear? What are the cellulite stages? Stage 1: when a woman is standing or lying down, the skin is smooth. But when press is exerted, some small “potholes” appear. Stage 2: when a woman is lying down, the skin is smooth, but when standing the skin looks like an “orange peel”. Stage 3: Cellulite is obvious in every position, with or without pressure and it concerns mainly elderly women. What we discern is that skin may prolapse and is probably painful due to pressure. Are there any ways of fighting cellulite? In order to fight cellulite, it is recommended to avoid all its causing factors and take up regular exercise and proper diet. However, when these practices are not sufficient enough, the latest Cosmetic Medicine offers several different methods that treat the root of the problem. Both treatments are usually combined. What exactly LASER is Smoothshapes? 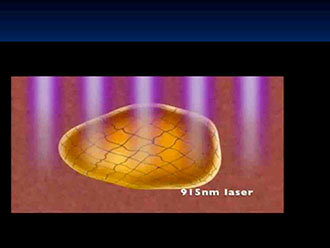 LASER Smoothshapes™ is the most contemporary, high-tech medical device for the cellulite treatment. LASER Smoothshapes™ is the first and only LASER system for the cellulite treatment, approved by the US Food and Drug Administration (FDA). 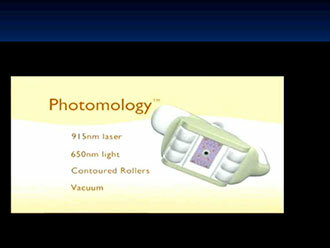 It uses the innovative technology of Photomology ™ contributing to long-term treatment of the problem. 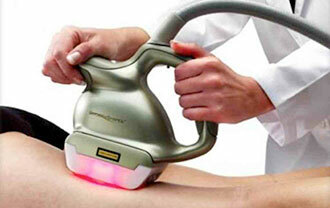 How does the LASER Smoothshapes act against cellulite? 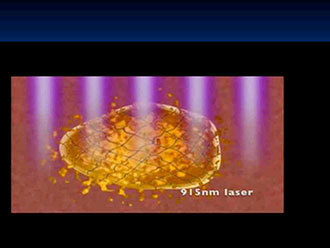 LASER Smoothshapes consists of a diode LASER (i.e. 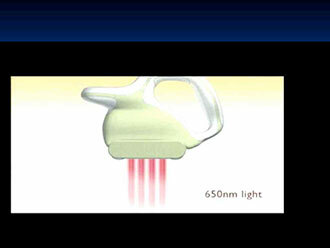 an infrared light) and a suction system that is supported by special rollers. The diode LASER operates at 915nm, which means that it does not affect the skin surface elements; it penetrates the deep tissues and is absorbed selectively and exclusively by the adipocytes, causing a liquefaction of the fat contained therein. 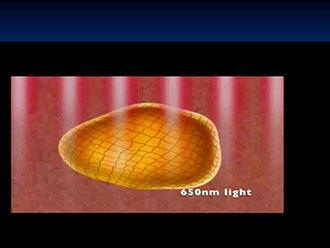 At the same time, the infrared light at 650nm increases the permeability of the adipocytes’ cell membrane, where the liquefied fat moves to the interstitium from where the special rollers of SmoothShapes ™ device with the action of suction, help its drainage towards the lymphatic system. This process leads to the contraction of the adipocytes, reduction of cellulite and acts beneficially with regards to the collagen createon and the tightening of loose skin. Result of all the above are the loss of points, skin smoothing and surprising elimination of the “orange peel” image in the problematic areas. The Smoothshapes ™ method can be applied all year-round. The number and duration of sessions varies depending on the severity of the problem and the extent of the problemαtic area. In order to achieve the desired result, about 8-12 sessions are required, two per week, which means that it takes about 4-6 weeks to reach the goal. In the next six months, the result is improving month by month. To maintain a good result, a simple maintenance protocol should be followed with a repetitive treatment two times each semester. 4 times a year are sufficient enough to achieve a good result after the completion of the standard treatment of 8 or 12 repetitions. Does the LASER Smoothshapes treatment hurt? It is a painless and non-injury treatment. During the treatment, no medical practice or chemical substance is required, but the natural functions of the body and skin are simply activated and rejuvenated. The patient is lying down in a horizontal position and the doctor applies the LASER head onto dry skin following a parallel direction to that of the lymphatic channels. The skin should be clean and dry, without a prior cream application, so as not to hinder the action of the LASER beam light and so as to achieve maximum penetration into the fatty tissue. The results can be recorded by measurements and photographs, before, during and at the end of treatment, when it has been proven that the skin has been restored to a large extent. With the application of LASER head on the skin surface, fat liquefaction is achieved as well as its removal from the fat cells in the interstitial tissue. With the action of special rollers following the lymphatic street, we achieve the elimination of the liquefied fat into the systemic circulation. Drinking much water during the days of treatment is a basic prerequisite, so as to hydrate the application area and facilitate the fat mobilization. Since the LASER light beam of Smoothshapes, is selectively absorbed only by the adipose tissue, without being recognized by the elements of the skin surface, there is no problem for tanning on the treatment area. Girls who undergo the Smoothshapes cellulite treatment can do sunbathing or Solarium during the cellulite treatment without any problem. For an optimum result of the LASER Smoothshapes cellulite treatment, it is highly recommended it be combined with body Mesotherapy. What is body Mesotherapy and how can it improve the condition of cellulite? As already mentioned, cellulite is caused due to thickened – “inflated” fat cells just under the skin, resulting in the accumulation of toxic substances and water retention due to poor blood circulation. Consequently, one way to improve the condition of cellulite is both to improve the microcirculation in the subcutaneous level and to help to “deflate” the fatty adipocytes. We nowadays know that there are substances such as caffeine, aminophylline, dimethylaminoethanol, etc. which when infused in the subcutaneous tissue, increase blood circulation. There are also substances such as phosphatidylcholine, L-carnitine which activate lipolysis (injectable lipolysis) when injected into the subcutaneous tissue. 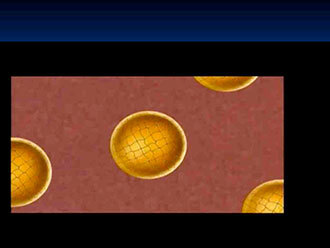 Mesotherapy, as the word itself indicates, aims at the mesoderm, exactly where cellulite lies. This injectable treatment is performed with the use of a special, very fine needle, injected into the mesoderm at about 0.3-0.5 cm, with very small quantities of the Mesotherapy solution. The Mesotherapy solution contains a combination of substances (Caffeine, aminophylline, dimethylaminoethanol, vitamins, glycolic acid, antioxidant factors, L-carnitine, collagenase, phosphatidylcholine, etc. ), which when are injected into the subcutaneous tissue greatly improve the image of cellulite because both increase the microcirculation, assisting in the removal of toxic substances through the lymphatic channels and “deflate” fat cells causing lipolysis. Does the body Mesotherapy for cellulite hurt? 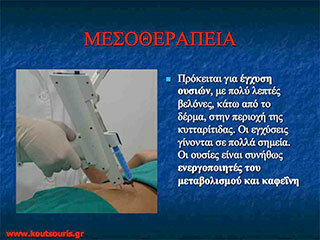 Mesotherapy is an injectable treatment. 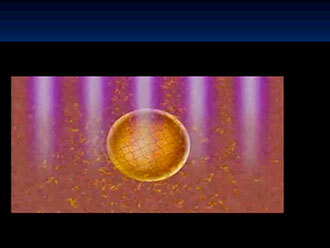 In theory it could be assumed that it is a painful treatment, but it is practically almost painless. This happens because the needles used in Mesotherapy are specifically designed for this purpose and they are extremely thin and the Mesotherapy solution does not hurt. How long does this treatment last and when should the body Mesotherapy for cellulite be repeated? The application takes about 20 minutes. Immediately after the treatment the area may appear moderate redness and swelling which normally subside within a few hours or days. The patient is able to normally return to his/her activities. The treatment is repeated approximately every four weeks and 3-6 sessions are usually required, in order to achieve a good result depending on the extent of the problem. It is very important mentioning that both the advanced LASERS technology and modern pharmaceuticals for the cellulite treatment along with our Mesotherapy techniques allow excellent results in the treatment of cellulite, even at its most advanced stages. 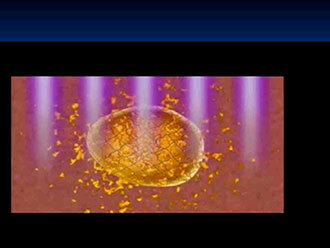 Nevertheless, the effectiveness of those modern treatments against cellulite is not known to the general public. Based on surveys, the majority of women (60%) is unaware of their existence or characterizes them insufficient, confusing them with older outdated techniques which are far from modern applications. At the same time, exorbitant amounts of money are spent for the purchase of slimming products (anti-cellulite creams, herbs, nutritional supplements etc. ), which in most cases fail to fulfill their advertising promises. The use of these products, only when combined with exercise and a healthy diet, can bring a slight improvement of the problem. In other words, even perfectly toned people following strict and healthy diet plan may have aggressive forms of cellulite. Cellulite is an extremely complex and not entirely decoded problem that requires absolutely targeted and scientifically reliable treatments to eradicate it. You can trust the knowledge and experience of our experts and let us take care of your image, in one of our three fully equipped Centers of Plastic, Aesthetic and Reconstructive Surgery in the cities of Athens, Tripoli and Nafplion.